With the death of Full Tilt Poker, accompanied by the death of Team Full Tilt Poker and the “Red Pros”, PokerStars looked to have a monopoly on poker player sponsorships. But lost in the mix was another online poker site that has been slowly acquiring some of the best poker players in the world for some time now: Lock Poker. Lock Poker is one of the flagship sites on the US-friendly Merge Gaming Network, and their recipe for success not only includes some terrific, innovative, promotions, but also an aggressive marketing campaign that includes a number of sponsored poker pros. 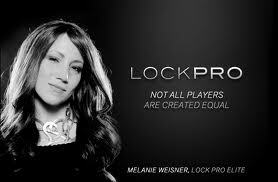 Some of the recent additions to Lock Poker’s Team LockPRO Elite are Melanie Weisner, Leo Margets, and Kevin Vandersmissen, three of the top young poker talents in the world. With 18 players on the Team Elite roster, as well as another dozen or so sponsored players, Lock Poker can boast one of the largest stables of sponsored players in the poker world. In addition to quantity Lock Poker also has some serious quality amongst their ranks including the perennial Online Player of the Year candidate and 2011 Player of the Year contender Chris “Moorman1” Moorman. Moorman is best known for being the biggest winner in online tournament history (estimates of Moorman’s career tournament earnings are in the $7.5 million range) and the online legend was one of the top live tournament players in poker in 2011. Moorman has won basically every major weekly in tournament history, and has captured the PocketFive’s Triple Crown an astounding 11 times in his career. Moorman, a former member of the illustrious Brunson 10 at Doyles Room, finished second on the 2011 Card Player Magazine Player of the Year leader-board and seventh on the site’s Online Player of the Year leader-board, an absolutely unprecedented accomplishment. Moorman is the face of Lock Poker, and considering the 2011 campaign he put together he could very well be one of the next faces of poker. Margets first made waves in the poker world as the Last Woman Standing at the WSOP; since then she has proven to be amongst the upper-tier of tournament poker players. Considered one of the most marketable females in poker, Margets is not just good-looking, but has proven a very capable player with over $670k in live tournament winnings for her career, including a win in the 2010 Full Tilt Masters Series. The EPT Snowfest runner-up is the most recent addition to the Lock Poker Team Elite roster, and the young Belgian seems to have a bright future ahead of him in the poker world. With just over a year of live tournament poker under his belt, Vandersmissen is already approaching $1 million in career tournament earnings. Lynch is now the Poker Room Manager at Lock Poker and acts as one of the top spokesmen for the site. An accomplished player in his own right, Rizen is the glue that holds the Lock Poker team together. Lynch is a perfect fit for the role, being one of the most accessible and knowledgeable players in the game. Evans is a UK poker pro with over $1.1 million in online poker winnings to his credit. Proficient at just about any format, Evans is still waiting for that one breakout tournament performance. The former Full Tilt Red Pro, Weisner is one of the newest additions to Team LockPRO ELITE, and the up-and-coming tournament pro is already one of faces of the site. Weisner has yet to breakthrough with a big live tournament win, but has pocketed over $1 million in online and live tournaments combined. A regular on the European poker circuit, Weisner counts poker superstars Liv Boeree and Kevin MacPhee among her inner circle. Another top online tournament player, Jarzabek has been transitioning to live tournaments, but still finds time to compete online, and is still racking up huge cashes. Pelligrino is a double threat in the poker world, having been successful in both live and online tournaments. Now mainly a high-stakes S&G Player, Pelligrino took to poker at the tender age of 15, and has accumulated over $1 million in tournament earnings for his career. Drummond earned the honor of being selected to Lock Poker’s Team ELITE by winning the 2011 Lock Pro Challenge. Drummond isn’t just some palooka off the street however, even before winning the Lock Poker sponsorship Drummond was considered one of the top online poker players in the world. Known to most poker fans simply as “Gank”, the former member of “The Crew” has a World Series of Poker bracelet to his name and is considered one of the top Omaha 8 or better players in the world. Connolly began his poker career as a tournament grinder, but now the longtime online poker pro can be found grinding away the high-stakes Mixed Games at Lock Poker. The UK pro is best known for his cash-game excellence, but he has also been making some headway in the tournament poker arena as well. Devlin is the epitome of an online cash-game grinder, and one of the biggest winners at Lock Poker. Stout is one of the most prolific tournament players in poker. Whether it’s a $30 online tournament or a major live tournament with a $10,000 buy-in you can be fairly certain that Stout is registered for the event. Known around the poker world by his earlier screen-name “Allin@420” Stout is also one of the top poker Tweeters and Facebook users. A former WSOP bracelet winner, Young is perhaps best known for openly calling out the legitimacy of Full Tilt poker a few years ago –perhaps one of the most accurate assessments of the online poker site ever! You can find full bios for each player at LockPoker.eu as well as information on where you can follow each player via Twitter and Facebook.